How can graduate students develop skills to communicate science to a wider audience? How can K-12 teachers increase their ecological knowledge and gain confidence to teach ecological concepts? Answers to these questions are currently being developed at four LTER sites that participate in the NSF funded Graduate Teaching Fellows in K-12 Education program most commonly known as GK-12. The program, initiated in 1999 supports fellowships for graduate students and upper level undergraduates to serve as resources in K-12 schools. Currently Central Arizona Phoenix (CAP), Short Grass Steppe (SGS), Jornada Basin (JRN) and North Temperate Lakes (NTL) LTER participate in the GK-12 program. At CAP, GK-12 fellows are directly involved in the Ecology Explorers program. They are using research protocols developed by CAP scientists to incorporate in teacher workshops and summer internships. They study bird populations, ground arthropods, bruchid beetles and plant diversity. This GK- 12 program run by Arizona State University is centered on experimentation and exploration. Human impact on land use along the Front Range of Colorado is the GK-12 theme at SGS. This matches well with the current research emphasis at this site. GK-12 fellows are using the Schoolyard ecology model to bring science into classrooms by engaging K-12 teachers and students in research related to grassland ecology, soil micro-arthropods in SGS, effects on prairie dogs on vegetation and water qulity monitoring among other topics. This summer, JRN started participating in New Mexico State University’s GK-12 project by involving fellows in a teacher workshop attended by one science teacher from every middle school in the county surrounding Las Cruces, New Mexico. Surveys of GK- 12 Fellows at NTL indicate that the program serves as professional development for graduate students. Fellows who have participated in the program report an increased interest in grant writing and outreach, and an improvement in making presentations and working as members of a team. They also find that the time Integrating LTER Research and Education through Graduate Students spent in the program has little or no negative effect on their research. GK-12 also provides professional development for teachers and enhanced science learning for K-12 students. "I have learned a lot about my own research, time spent in the classroom is more satisfying than being a teaching assistant"
Fellow Laurel Hartley knows that she "will always be involved in K-12 education" and adds that "GK-12 teaches fellows ways to merge their goals of being scientific researchers with their desire contribute to science education." While the goal of the GK-12 program is not necessarily to make K-12 teachers out of all graduate fellows, there are many lessons to be learned from spending time with high school students. "If you can get up in front of 30 high school students and coherently talk about your research," says Shortgrass Steppe LTER fellow Sanjay Advani, "there shouldn’t be an audience out there capable of intimidating you." 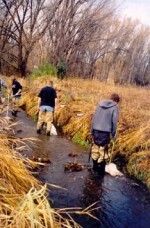 Students troll a stream for macroinvertebrates in Colorado. Photo courtesy Shortgrass Steppe LTER.